Let's Clean Up our School! During our previous Writing Workshop unit in Year 5, we completed our Personal opinion writing and moved into the persuasive writing section. The idea was for students to choose a topic to show their opinion about an issue they feel strongly about, be it local or global. This would then promote discussions, provide tie-ups with our SquISH personal goals and our Golden Rules. It demonstrated how our work was related to the UN's Sustainable Development Goals; all with the ultimate target of promoting our students to act by themselves because that action is needed. There were many excellent pieces of work throughout all the classes – it was a pleasure to hear the students read their own work to each other with fervent passion during the end-of-unit celebration! Just as pleasing, was the response from a group of students in 5M who decided to do something about the rubbish around our school including canteens, all around the temporary teaching blocks on the Astroturf and even out to the Green Space. There were 3 or 4 teams of friends who regularly went out during their lunch breaks, armed with rubbish bags and picker-uppers. They would fill a bag per team most lunch breaks! After sharing this with my colleague, Ms. Hubbers, she told me that a small group of her Year 3 students decided to take matters in their own hands and do something about the rubbish around our school. 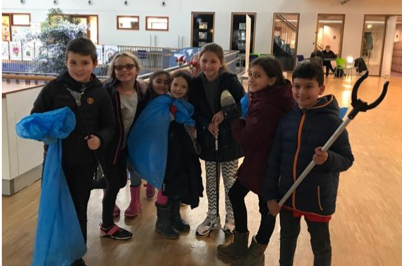 The Year 3 students felt that it was the right thing to do to keep our school clean, as part of their bigger global drive to remove as much plastic from our lands and our oceans as soon as we can. Therefore, we decided to see if the 2 groups (who had already worked together twice already on technology projects and in our Christmas reading buddy session) would like to work together – and they did! 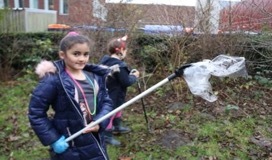 Here are some examples of the work that they did cleaning up around ISH.